The Fellowes 500C shredder has Sure Feed Technology allowing the user to have a truly walk away shredding experience. The Jam Guard System prevents shredding interruptions for jam free operation, while Smart Lock engages with each shred cycle to protect confidential information. Silent Shred offers ultra-quiet performance for shared workspaces. The energy saving Sleep Mode feature shuts down the shredder after 2 minutes of inactivity. There are 3 Start Delay options for starting shred jobs even after the workday. The 500C also offers innovative touch screen with back-lit LEDs, a convenient pull-out drawer for front loading of materials to be shred, and a versatile, flat top for easy office integration and additional storage space. Furthermore, the SmartLock engages with each shred cycle to protect confidential information. The Fellowes Auto Feed 500C Cross Cut shredder is the best shredder for office environment as it offers the user automatic interruption free shredding and with auto feed technology this paper shredder permits the user to have a hands-free shredding experience. Q. Can I use the AutoMax 500c in a big office? A. Certainly. The AutoMax 500c is designed for heavy use and is perfect for medium to large offices. Q. How much paper can it process? A. 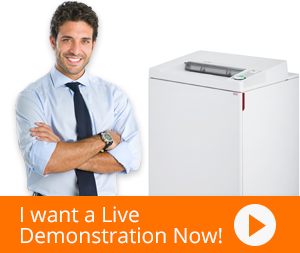 The AutoMax 500c shredder can process 8 feet of paper in one minute. Q. How long can it work nonstop? A. The AutoMax 500c has a continuous cycle time. It can run without any rest. Q. How loud is the AutoMax 500c? A. The SilentShred feature makes the AutoMax 500c extremely quiet and not noisy at all. Q. Can the AutoMax 500c shred only paper? A. No. You can shred credit cards and even CDs with it. Q. Does it come with any warranty? A. Yes, the AutoMax 500c comes with a 2-year warranty on the machine. Q. What is the material used in its design? A. The body is made of plastic and the blades are made of high quality steel.